Italian fruit breeding consortium CIV will showcase five new strawberry varieties at this week’s Global Berry Congress in Rotterdam. Two of the varieties, CIVRH612 (branded Ania) and CIVRH621 (branded Cantus), are everbearers with an elevated need for cold weather, making them ideally suited to Northern Europe and other cooler climate areas. 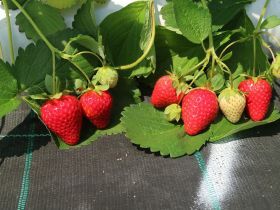 Both varieties are currently being planted in Great Britain and the Benelux region. “They are characterised by excellent taste and aroma, they have a shelf life of about seven days, and greater skin elasticity, allowing for prolonged handling,” said CIV’s variety manager Marco Bertolazzi. For warmer climates, CIV has developed the CIVS906 (branded Elide) and CIVRL333 (branded Xante) varieties. Elide is a June-bearing variety with little need for cold temperatures. Bertolazzi said Elide adapts well to Mediterranean climates, making a uniform, prolonged harvest possible. One of the first of its kind developed by CIV, Xante is an early-variety everbearer which also has little need for cold temperatures. Finally, the CIVNB557 (branded Lycia) variety is characterised by its “large size and qualitative properties,” according to Bertolazzi. With key international players in the small fruit industry gathering in Rotterdam for this week’s congress, Bertolazzi said it was the perfect platform to share details about the new varieties. “As always, CIV's commercial strategy includes working closely with all key players on the supply chain, involving retailer category managers in identifying the best selections, and thus those best suited to the needs of their customers,” Bertolazzi explained.